«1892: Missouri forfeits its scheduled Nov. 5 game against Nebraska in Omaha, refusing to play against an African-American player, NU halfback George Flippin. This Lincoln Evening News item from two weeks earlier mentions the likelihood of a Mizzou forfeit. 1897: Nebraska has the week off, but there's a big buildup for the upcoming game against Kansas. 1902: Johnny Bender's touchdown run on a fake kick helps the Cornhuskers beat Kansas, 16-0. 1917: Big plays are plentiful as Nebraska rolls to a 52-0 win over Missouri. «1922: After weeks of being built up as a wonder team, the high-flying Huskers land with a thud in a 9-6 loss at Syracuse. Nebraska manages just three first downs, and the only NU touchdown comes on a fumble return. 1962: Underdog Nebraska hammers Kansas with 32 points in the first 18 minutes and rolls to a 40-16 win in Lawrence. Each of the game's seven touchdowns was followed by a successful two-point conversion. Joe Orduna high-steps for 8 yards against Iowa State. 1967: The Huskers hold Iowa State to negative rushing yards in a 12-0 win, NU's second consecutive shutout. 1972: The Blackshirts yield their first points since Sept. 23, but the Huskers win 33-10 at Colorado. 1977: Nebraska keeps Mizzou QB Pete Woods in check in a 21-10 victory in Columbia. 1982: Mike Rozier breaks Bobby Reynolds' single-season rushing record in a 48-10 win over Oklahoma State. 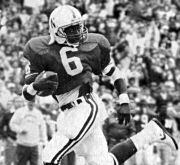 «1987: Keith Jones rushes for 240 yards on just 15 carries in a 42-3 victory over Iowa State. 1997: Nebraska preserves its national championship hopes with the famous flea-kicker win at Missouri. 2002: The Jayhawks are competitive for a quarter before falling 45-7 to the Huskers in Lincoln. 2007: A 73-31 romp over Kansas State gives the Huskers their first win in six weeks, and Joe Ganz earns Big 12 and national player-of-the-week honors. Also, Jim Rose resigns as the radio voice of the Huskers, citing personal reasons. 2012: The Huskers rally from a 20-6 halftime deficit to beat Penn State, 32-23.